Seima-Turbino phenomenon refers to a pattern of burial sites with similar bronze artifacts dated from 2100 BCE to 1900 BCE found across northern Eurasia, from Finland to Mongolia, which has suggested a common point of cultural origin, advanced metal working technology, and unexplained rapid migration. The buried were nomadic warriors and metal-workers, travelling on horseback or two-wheeled chariots. The name derives from the Seima (Sejma) cemetery at the confluence of the Oka River and Volga River, first excavated around 1914, and the Turbino cemetery in Perm, first excavated in 1924. The Seima-Turbino phenomenon refers to a pattern of burial sites dating from 2100 BCE to 1900 BCE. (Originally dated to 1650 BCE onwards.) found across northern Eurasia, from Finland to Mongolia, which has suggested a common point of cultural origin, advanced metal working technology, and unexplained rapid migration. The buried were nomadic warriors and metal-workers, travelling on horseback or two-wheeled chariots. The name derives from the Seima (Sejma) cemetery at the confluence of the Oka River and Volga River, first excavated around 1914, and the Turbino cemetery in Perm, first excavated in 1924. 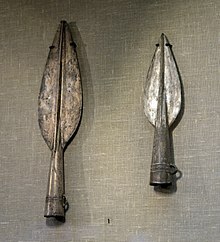 The bronze in Seima-Turbino weapons is identified as containing tin based bronze originating from ore from the Altai Mountains region. Seima-Turbino type bronzes have been discovered as far west as at the Borodino treasure in Moldavia. The bronzes found were technologically advanced for the time, including lost wax casting, and showed high degree of artist input in their design. These cultures are noted for being nomadic forest and steppe societies with metal working, sometimes without having first developed agricultural methods. The development of this metalworking ability appears to have taken place quite quickly. The Altai Mountains in what is now southern Russia and central Mongolia have been identified as the point of origin of the cultural enigma of Seima-Turbino phenomenon. The culture spread from these mountains to the west and to the east. Artefact types such as spearheads with hooks, single-bladed knives and socketed axes with geometric designs traveled west and east. Although they were the precursor to the much later Mongol invasions, these groups were not yet strong enough to attack the important social sites of the Bronze Age. It has been conjectured that changes in climate in this region around 2000 BC and the ensuing ecological, economic and political changes triggered a rapid and massive migration westward into northeast Europe, eastward into China and southward into Vietnam and Thailand across a frontier of some 4,000 miles – supposedly this migration took place in just five to six generations and led to peoples from Finland in the west to Thailand in the east employing the same metal working technology and, in some areas, horse breeding and riding. However, further excavations and research in Ban Chiang and Ban Non Wat, Thailand argue the idea that Seima-Turbino brought metal workings into southeast Asia is based on inaccurate and unreliable radiocarbon dating at the site of Ban Chiang. It is now agreed by virtually every specialist in Southeast Asian prehistory, that the Bronze Age of Southeast Asia is too late to relate to Seima-Turbino, and the cast bronzes are quite different. The same authors conjectured that the same migrations spread the Uralic languages across Europe and Asia. Another subclade of Y-DNA Haplogroup N, which reaches some of its highest frequencies among the Uralic peoples, is N1b (F2930), the time and geographical range of which coincides with the time and geographic range of the migrations. Estimated to be 4000 years old, N1b spread north and westwards from its original locus in Southern Siberia, exactly as Seima-Turbino migration did. However, recent genetic testings of sites in south Siberia and Kazakhstan (Andronovo horizon) would rather support a spreading of the bronze technology together with Indo-European language migrations eastwards, as this technology was well-known for quite a while in western regions. ^ Marchenko et al. 2017. ^ Anthony 2007, pp. 447. ^ Anthony 2007, pp. 444-7. ^ Anthony 2007, pp. 443-4. ^ a b Chernykh, E.N. (2008). "Formation of the Eurasian "Steppe Belt" of Stockbreeding cultures". Archaeology, Ethnology and Anthropology of Eurasia. 35 (3): 36–53. doi:10.1016/j.aeae.2008.11.003. ^ Chernykh 1992, p.220-21, figs. 74, 75. ^ a b Keys, David (January 2009). "Scholars crack the code of an ancient enigma". BBC History Magazine. 10 (1): 9. Wikimedia Commons has media related to Seima-Turbino phenomenon.